Acme H4-W05D4 workstation, socket H4 LGA1151, DDR4 memory, Black Color tower. TDP support up to 65W, select the processor integrated graphics. 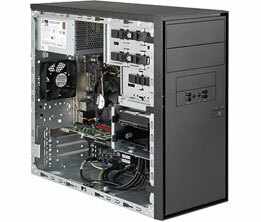 mini Tower quiet case with 300W High Efficiency power supply, 80+ centified. 1x 80mm rear fan included. Width: 6.89 in. Height: 14.65 in. Depth: 16.85 in. *** Processor, Memory, hard disk drive are not included.